The kitchen is said to be the most important room in your life – but another room that is gaining more and more importance in our homes is the home office. An is a place where there would be room for many things: concentration and contemplation, creativity and inspiration. The office would also like to be a place that contributes to your desire to work, and care must be like to be both comfortable and functional. Looking for inspiration for some of the good tricks, you can take advantage of when you are about to decorate your home office, here’s some suggestions. Take advantage of the space you have. 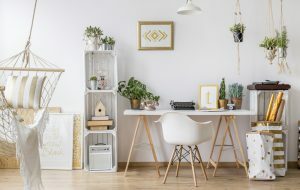 For example you can choose to decorate your home office under a staircase – a place that otherwise would only be used for storage, to collect dust or family muddy wellies. You do not necessarily have a separate room for your home office. You can also integrate your desk in the living room – but here it is important to choose their furniture with care and also try to limit clutter such as printers, servers, etc. In a cabinet or similar. Be sure to add a few domestic items for your office. For example you can set up a panel or hang up photos or images that can serve as inspiration. It can also be as simple as a lamp, a skin on the floor, plants or vases. Inspiration and creativity often comes from an environment that homey or personalized for you. This can for example be seen in your choice of color scheme – is your office kept in gray tones, it is bright or maybe very colorful? – And in the choice of furniture or works of art and other decorative objects. If you need more inspiration, it might be an idea to put themselves to the keys or to invest in a book with ideas for just this room in your home. The blog boligcious.dk come here with some examples of solutions that can inspire you in your own decor. You can also buy the book Home offices – Creative layout of workstations in the home of Trine Sofie Meinche-Utzon and Sif Meincke, which offers suggestions for creative design of jobs at home.